"How to communicate strong opinions without offending?" “How to communicate strong opinions without offending?” is one of marketers’ top 100 questions about content marketing. 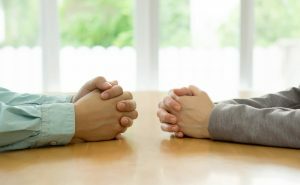 How to communicate strong opinions without offending? The short answer: it’s impossible. A longer answer: think carefully through how to use strong opinions, by using the research and insights below. Thought-provoking content often leads with strong opinions. When you communicate a strong opinion, you automatically divide the audience into 3 parts: people who agree, people who disagree and people who haven’t decided yet. No matter what you do, someone is bound to be offended. Why? Because people take offense even at silence. When your CEO or company expresses strong opinions, expect and prepare for someone to take offense. 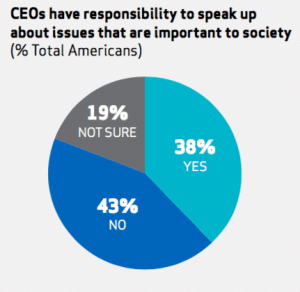 People are divided about whether CEOs should express strong opinions. Whether your company expresses strong opinions or not, be strategic. CEO activism has support, but it does not always create a favorable impression. 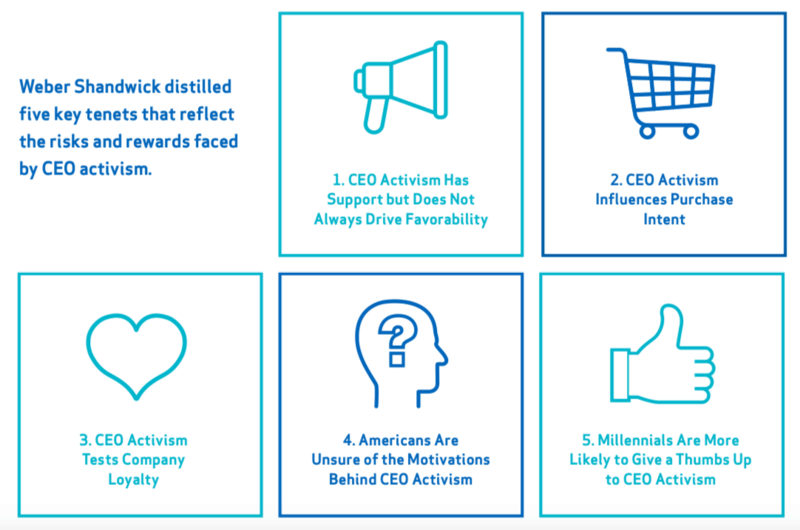 Also, CEO activism influences customers’ purchase intent. CEO activism tests the loyalty of certain employees. 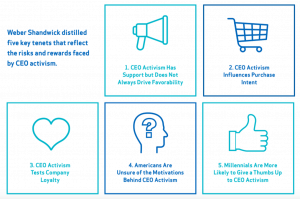 People are unsure about the motivations that drive CEO activism. 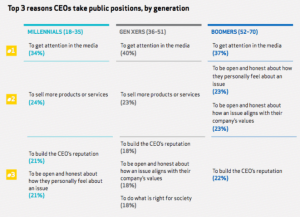 Millennials are more likely to approve of CEO activism than other generations. How can marketers put these research findings into practice? A company can choose to play any of 3 roles when it confronts a controversy. 1. Play it safe: stay silent. Some companies choose to keep quiet in times of controversy. Conventional wisdom is to keep your mouth shut. That’s what silent nonparticipants do. I’ll never forget a fellow marketer who once mentioned President Trump in his speech. The mere mention elicited such a strong backlash that he vowed: “Never again.” The fear on his face spoke volumes. People and companies choose silence instead of strong opinions when they fear offending customers, employees or investors. They don’t want to wade into what they see as an unnecessary controversy. Instead, they choose to be neutral, even milquetoast. Silence comes at a cost. Silence offends some people and it measurably affects consumer behavior. Specifically, companies that talk about their values but don’t stand up for them offend people, research by Clemson University and Drexel University shows. In general, 18% of shoppers make an unplanned in-store purchase. That’s the baseline. A values-oriented company (one that states its values) gains a 6% upside from taking a stand that aligns with its values, and it risks a 9% downside from not taking a stand. A results-oriented company (one that does not state its values) gets an 8% upside from not taking a stand, and it risks a 5% downside from taking a stand. Should your company take a stand? It depends. Is your company values-oriented or results-oriented? Does your company articulate values to employees or on your website? People sniff out hypocrisy and punish it. And they reward companies whose values, words and actions align. A company that articulates and stands up for values gains business. When a company that articulates values but does not take a stand loses business. A company that does not articulate values and does not take a stand gains business. When a company that does not articulate values but takes a stand loses business. In 2016, MJ began to take a public stand, condemning both police violence and the killing of police officers. He called for racial unity. MJ’s shift reflects “an emerging trend that is only going to increase.” The Dawn of Activism study predicts that CEO activism is just getting started. 2. Be a facilitator of dialogue. Companies can create great content by getting two sides to talk face to face. When people divide over an issue, there’s a pressing need for dialogue and debate between the two sides. It’s the only way to move forward rather than stay deadlocked. Your company can lead this conversation or facilitate a dialogue. It can encourage both sides to talk, listen, learn and even start to understand each other. For example, Virgin convened the first dialogue between animal rights activists, aquariums and Sea World. These opponents had criticized each other frequently in news and social media, but they had never met for a face to face dialogue. Following that meeting, Richard Branson launched the Virgin pledge on sea mammals in his blog. Later, Sea World pledged to stop capturing sea mammals in the wild. Create content by leading a conversation that needs to be had in your industry. Another example: take the case of a business controversy, where some competitors sell Technology A, and others sell Technology B. A company could choose to align itself with either Technology A or B, and lead an open debate. A company that sells both technologies (or neither) could become the neutral facilitator for such a debate. 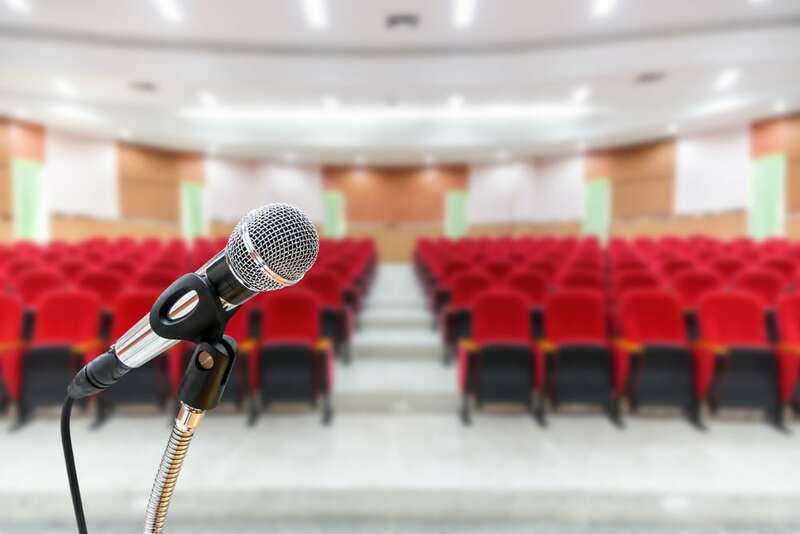 What if your company sponsored or moderated a debate on the critical issues in the world or in your industry? Getting two opposing sides to talk to each other in an effort to find common ground is critical. Wading into a fight could make your company a bum. Or a hero. 3. Be a values-driven advocate. Penzeys Spices CEO Bill Penzey takes hard, public stands on political issues. In customer emails and social media posts, he writes about controversies such as immigration, mass shootings, scientific truth, and election outcomes. In celebration of marriage equality, he took a customer’s suggestion and featured rainbow spices. To mark the anniversary of a campaign statement, “Tremendous infectious disease is pouring across the border,” he offered customers free Mexican vanilla. Orders shot up 1600%, leading Penzey to tap the brakes on the promotion. In his Facebook post, “Cooking Trumps Racism,” Penzey wrote, “You just voted for an openly racist candidate for the presidency of the United States of America.” His comment went viral in all the news media – right, left and middle. What are the results of Penzey’s stirring such controversies? He’s received about 35,000 emails, mostly supportive. Traffic in 60+ retail stores fell 3%. This is the future,” Penzey told the Milwaukee Journal-Sentinel. “I think if you don’t care about your customers and what they care about, in a world of social media, no one’s going to talk about you. REI pledged to pursue bipartisan support to protect public lands. For outdoor recreation companies, defending public lands is an easy choice, in the interests of their business, customers and employees. Still, dangers lurk. The Dawn of CEO Activism study identified specific risks in courting controversies. People see multiple motivations driving activist CEOs who speak out. People legitimately wonder whether CEOs take a public position only to seek publicity, build reputation, or sell more products. Or are CEOs driven by nobler motivations? The top 3 reasons CEOs speak out? Answers vary by generation. 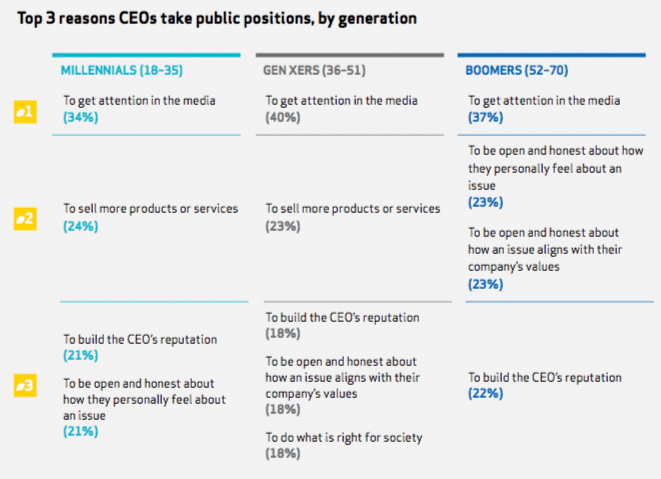 While everyone suspects that CEOs take a stand for publicity, Baby Boomers are likelier to think CEOs are open and honest on how an issue aligns with company values. What’s the upshot? Marketers have 3 strategic choices for how to approach controversy. Other approaches offer far more risk than reward. How to take an intelligent approach to controversies? 1. CEO activism is just getting started. 2. Establish a link between the issue and the company’s values and business. 4. Ensure market intelligence is up-to-date. 5. Discuss the pros and cons with the board. 6. Conduct a risk-benefit analysis on the effects of company reputation. 7. Fully commit the time and resources. 8. Look in the mirror. 9. Find partners to gather momentum. 10. Consider the channels, messages and tone of voice used. 11. Have a crisis preparedness plan for a potential social media firestorm. 12. Develop a thick skin. Read the whole study before you wade into a controversy. Most of all, you don’t want your company to take a stand, hurt its business and be forced to back down. Chick-fil-A articulates values to employees. But when its CEO waded into a controversy about marriage equality, the blowback from activists silenced the company. Starbucks quickly backed away from an anti-racism campaign that encouraged baristas to start conversations about race. Each company needs to choose its own path, the one that’s right for your customers and culture. 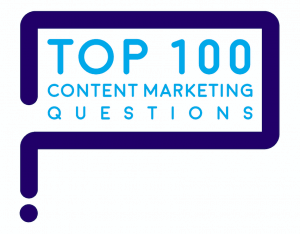 “How to communicate strong opinions without offending?” is one of marketers’ top 100 questions about content marketing. 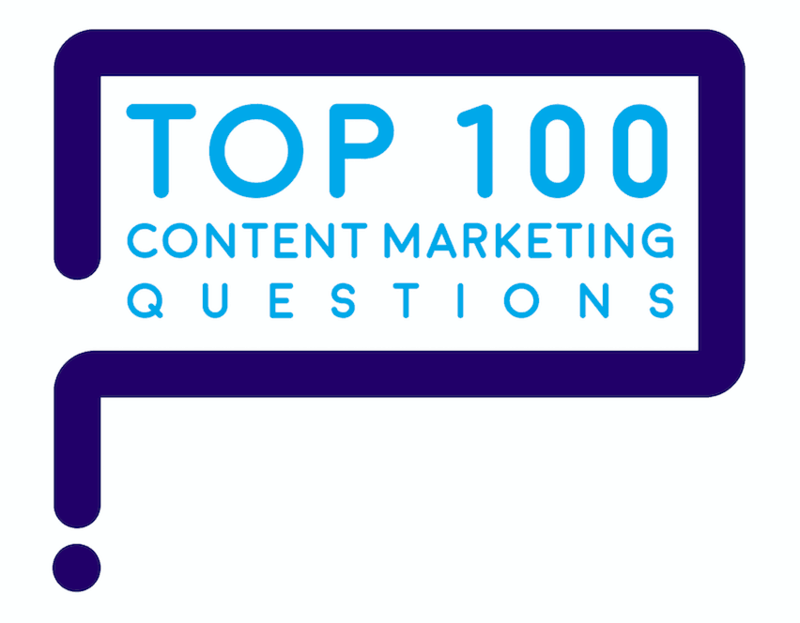 For more information on the study that identified marketers’ top 100 questions, see this blog. I predict: this blog will offend someone. And it will help someone else grow their business.